Think Detection. Listen to your body—early detection and prompt treatment is the best way to correct possible damage. The subtle aches and pains we experience may be our bodies’ way of telling us that something needs attention. Think Prevention. Many injuries are preventable. Performing repetitive tasks in unnatural positions can put strain on our muscles, joints, and tendons, applying ergonomics at work can go a long way in offsetting injuries. Think Activity. Strengthening our bodies through proper diet and regular exercise can help them handle the work we put them through. If you are experiencing pain and suspect a work-related injury, see your doctor and notify your supervisor immediately. Please remember to submit all medical documentation to the Health Promotion and Wellness dept. 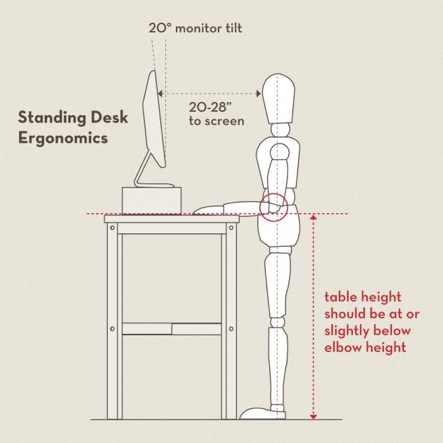 Proper ergonomics for sitting and standing desk.